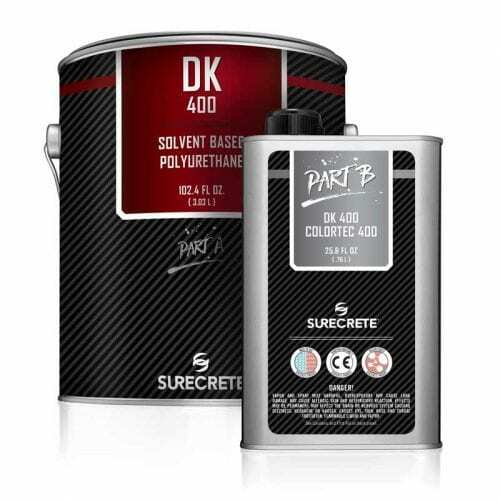 SureCrete’s DK400 is a commercial grade high gloss floor polyurethane solvent based for heavy-duty high traffic interior floor topcoat. Dura-Kote solvent-based clear high gloss floor polyurethane is a 2 component 51% solids, acrylic aliphatic polyurethane designed as a non-yellowing clear coating for interior concrete, concrete overlays, or as a clear top finish coat on epoxy systems. The high-gloss clear top coat generates the premier balance of strength, added UV stability, flexibility, chemical and scratch resistance that is both user-friendly and extremely durable. When dealing with protective coatings for concrete, which sealer you choose can vary wildly based upon the arena that the sealer is going to be applied in, the different chemicals it will be exposed to, as well as the amount of foot traffic or abrasion it will endure. In the case of choosing a sealer for an interior concrete application or overlay, there are few coatings that offer the balance of cost-efficiency and resilience as solvent polyurethane sealers. Dura-Kote Polyurethane solvent based clear topcoat has been formulated to be one of the most mechanically and chemically resistant coatings available on the market today. Pour 1 part “B” into four parts “A” in a large mixing container (we pre-measured the kits to make it easy on you! )and mix mechanically for a minimum of 2 minutes. Use a premium, de-fuzzed, phenolic core roller to roll out thin coats over working area, making sure to maintain wet edges and backroll the entire surface. Two coats are suggested with any interior project receiving a polyurethane coating, with the second coat being applied as soon as the first coat can be walked on, and is used in the same manner as the first layer. While not necessarily required, we suggest the use of a sacrificial wax coating to extend the life of the floor and add a measure of slip resistance. Question: Can I use just one coat of Dura-Kote Polyurethane SB? Answer: Yes, but for the best results, we highly recommend using two thinly applied coats. Question: Will Dura-Kote Polyurethane SB self-level and fill small holes? Answer: Yes, slightly. It is a higher solids content coating than an acrylic sealer but is not strong enough to fill large voids. 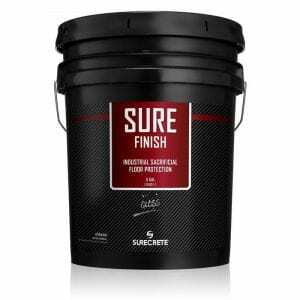 Question: Can Dura-Kote Polyurethane SB be used outside? Question: Can I use just one coat of Dura-Kote DK 400WB Water-Based Clear Polyurethane WB? Answer: Technically yes, however, it is not suggested. For the best results, we highly recommend using two thinly applied layers. That said, Dura-Kote Polyurethane products have been known to function better than comparable sealers in situations where a single-coat interior sealer is required. Question: Will Dura-Kote Floor Polyurethane WB self-level and fill small holes? Answer: To a very slight degree, yes. It is a higher solids content coating than an acrylic sealer but is not robust enough to fill large voids. Question: Can Dura-Kote Polyurethane Clear Water-Base be used outside? Answer: No, polyurethane coatings are not breathable in nature and therefore should not be used in exterior applications. Question: I have strict VOC laws in my area, can I use Dura-Kote Polyurethane WB? Answer: Check with your local municipalities to be certain, but given its extremely low VOC rating at less than 75 grams per Liter, this product can be used in almost all states or municipalities.